Michael O’Connor Clarke is one of the world’s truly great guys. Besides being smart, funny, caring, hard-working, a good husband and father — and pretty much all the other positive stuff you could pack into a bio, Michael was one of the first people to not only dig The Cluetrain Manifesto, but to grok it thoroughly at every level, including the multiple ironies at all of them. And to continue doing so through all the years since. Like three of Cluetrain’s authors, Michael was a marketing guy who was never fully comfortable with the label or the role, and broke every mold that failed to contain him. Unlike those three, however, he continued to labor inside the business, which still needs many more like him. Because, from the start, Michael has always stood up for the the user, the customer, the individual whose reach should rightly exceed others’ grasp. His labors are suspended, however, while he takes on a personal battle with esophogeal cancer. 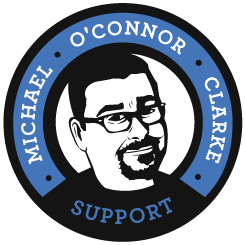 Friends of Michael’s have put up SupportMichaelOCC.ca, so all of us who care about him and his family can easily lend support. He’s a sole breadwinner with four kids, so this is a tall order. Whether you know Michael or not, please do what you can.